The Ford Raptor is one of the most creative and successful vehicles in recent memory, a joyous interpretation of what a performance car is. But as second generation Raptors now prowl our nation’s highways and byways one shortcoming (lol) has become clear: The Raptor is too big. I, of course, am not the target market for the Raptor. I am 1) not a large man. I’m 5'9" and 150, and I fit better into a Ford Courier let alone any F-150. In addition, I am 2) not the owner/operator of a construction company so I can’t afford a Raptor anyway. Ford probably does not care about me. That’s fine. I am merely the messenger of truth. If you are looking for the exact specs of the Raptor, I will give them to you, though I could really sum things up faster if I just told you that it’s the size of a small house and would comfortably fit three llamas. And those numbers are for the smaller SuperCab. The SuperCrew is yet bigger, at 231.9 inches long, weighing 5,697 pounds. How big is this? It’s too big. 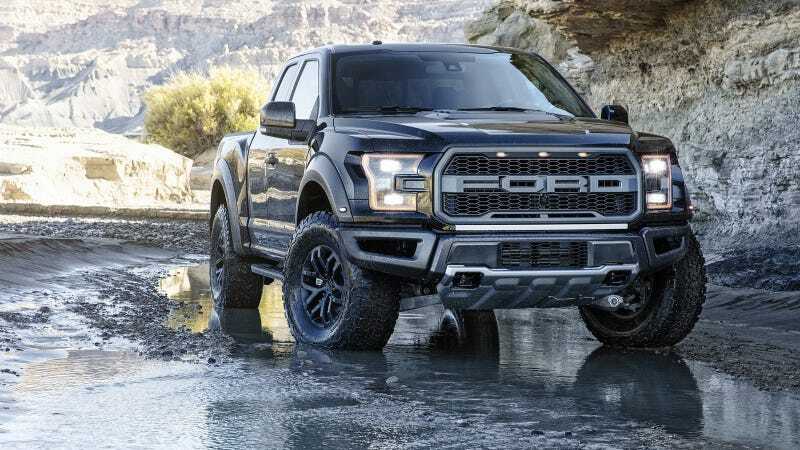 The body is a good half a foot wider than an equivalent normal F-150, and the Raptor is a good two or three inches taller, as well. But hey, this all makes sense for the Raptor’s main reason for being, though, right? It’s supposed to be huge to go offroad, isn’t it? Well, sort of. It’s only good at one thing: Driving fast over the open desert. Anything else makes it punitively girthsome, as my offroad colleage David Tracy pointed out when he drove this thing. Again, I understand Ford designs the Raptor for desert running and little else, and that’s what made the first generation so desirable. But even the first generation Raptor was reasonably sized compared to the current model. That made the first Raptor accessible to people who wanted to enjoy the benefits of a cool, fun, powerful performance truck with desert-ready suspension. I understand that. That’s why I bought a Baja Bug to drive around New York City, and that’s why I put Class 11 Baja shocks on my current VW. Desert gear is actually well-suited for America’s terrible, rough-but-high-speed roads. The only problem is that the current Raptor isn’t sized to be a cool, fun, powerful performance vehicle. It’s sized to invade France. It’s either that or to carry R2 units across Tatooine. Ford’s Ranger Raptor can’t come soon enough. CORRECTION: A number of readers have reached out to me to point out that the previous generation of the Raptor is just as long, tall, and wide as the current generation, which is factually correct. (The full specs are on page 21 here.) I appreciate these notifications. I will, however, point out that the original Raptor was smaller in its heart. I can’t explain how I know this other than that Raptors speak to me. Moreover, the Raptor is still too big.